What Are The Best Acupressure Charts? Need An Acupressure Chart To Guide Your Treatments? If you use acupressure techniques on a daily basis, or if you are just starting out with acupressure, it can be very helpful to have an acupressure chart to guide you. An acupressure chart generally shows you one or multiple meridians highlighted on the human body, along with the location of each acupressure point along the meridian. 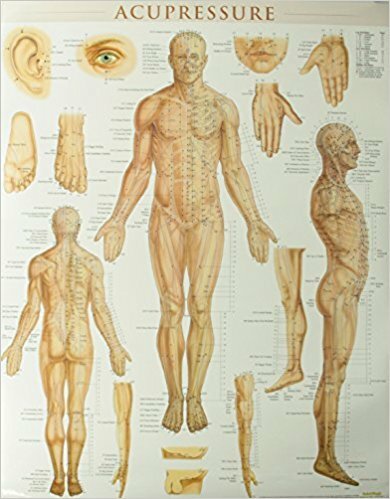 You probably already know that we have an online acupuncture meridian guide that has every acupuncture meridian in the human body on display, along with all 361 acupoints as well. Since acupressure uses the same meridians and acupoints as acupuncture, you can use an acupuncture meridian map to guide your acupressure usage as well. If you want to purchase that meridian guide in downloadable PDF form, it's available in our store. But let's talk about physical charts that you can actually hold in ​​​​​your hands or pin on your wall to guide you as you use acupressure on yourself or others. One thing you should know is that most acupressure charts won't come with a step-by-step acupressure guide for your health conditions. That's simply because there are a lot of acupoint combinations out there to use for various health conditions, and to write them all out would fill up a whole book. We've assembled an online guide to treating a few common health conditions like back pain or nausea, which you can view in our acupressure guide. The first way to use a physical acupressure chart is to simply have some fun using acupressure on random acupoints around the body. With an acupressure map guiding your way, you'll be able to experiment on putting pressure on various meridian points and seeing if it relieves your health conditions. For example, it's well known that the points of the lung meridian are powerful at helping the lungs heal from lung-related problems like asthma or coughing. You could use an acupressure chart of the acupoints in the lung meridian to guide your acupressure as you stimulate each point along the meridian, until you find one that provides relief. An alternative method is to follow a guide that's been written by a professional acupressure practitioner. You can find these guides online like ours which I linked to above, or in a book like some of the ones recommended in our acupressure guide. You can also find video guides on Youtube and elsewhere for acupressure instructional videos. Regardless of where you get your instructions, a physical acupressure chart that you can hold in your hands is a neat little addition to any acupressure practitioner's arsenal, and most professional practitioners probably own several charts of the various meridians. Let's take a look at some of the popular acupressure charts that are available to order online. There aren't just digital downloads. 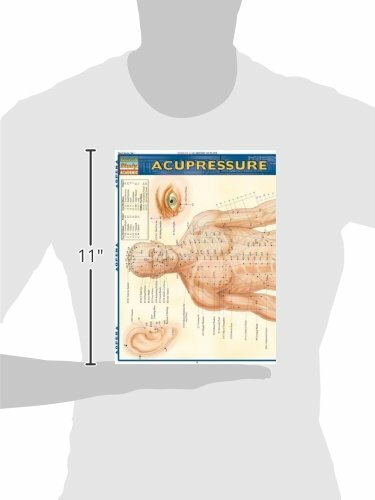 They are physical posters and papers that you can hold in your hands as you practice acupressure. This nice little acupressure chart is big enough to see all the meridians of the human body, but small enough to fit in your hands or set on a coffee table while you are practicing acupressure on yourself or a friend. Some customers complained that it contains technical terms related to acupressure and traditional Chinese medicine that only advanced acupressure students will understand. Compact size, fits in a folder or in your hands. Lots of technical information for acupressure professionals. Clearly labels all the meridians and acupoints of the human body. This is a full size acupressure poster designed for hanging on your wall. This particular design is made and sold by Michael Gach, the author of the famous acupressure book Acupressure's Potent Points. 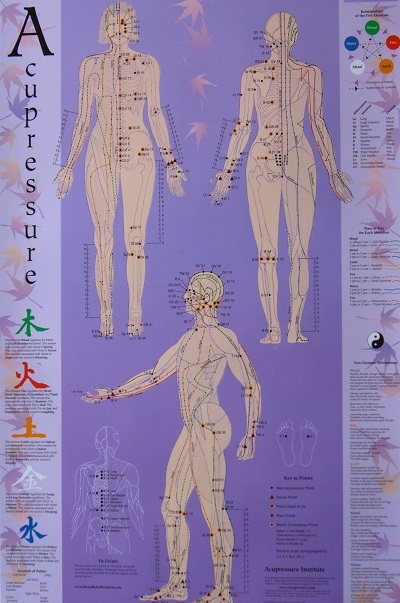 This acupressure chart is lovely to look at with its beautiful array of colors and traditional Chinese symbols and art. Big and beautiful - perfect for hanging on your wall. Comes with a mini guide of acupressure point combinations for healing. Designed by world famous acupressure teacher Michael Gach, so you know that it's accurate! This nifty laminated acupressure chart is excellent for showing you the acupressure points on the various parts of the body. As you can see from the picture above, it shows you the arms, legs, hands, feet, and other parts of the body separately from a different angle than just the front or back of the body. This makes it an excellent choice for finding the exact location of all of those points. Shows each body part individually so you can find every acupoint. Large enough to mount on your wall. You can see everything that needs to be said about this chart by looking at the image of it. 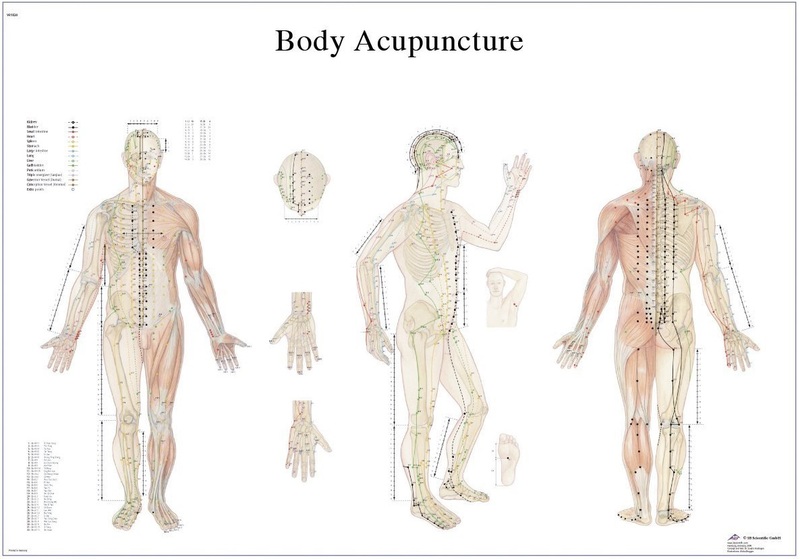 It is another anatomical-based acupuncture chart that lays the meridian lines and acupoints over the muscles and bones of the body. Medium size for hanging on your wall. Shows muscle and bone locations under meridian lines.